Yes, it bolts right on and it’s a VERY worthwhile upgrade. The early style steering box was a poor design from the beginning. 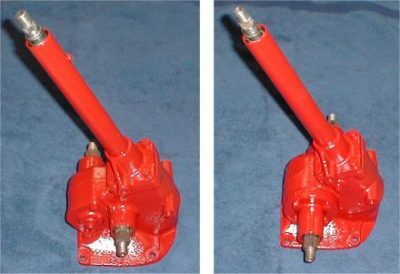 The 8N had only been in production a couple of years when Ford figured that out and upgraded to the better designed Spicer type steering box that was used for many years after. Add some age and wear to that poor early design and you’ve got a steering box that will never be able to fully eliminate the sloppiness in the front wheels. 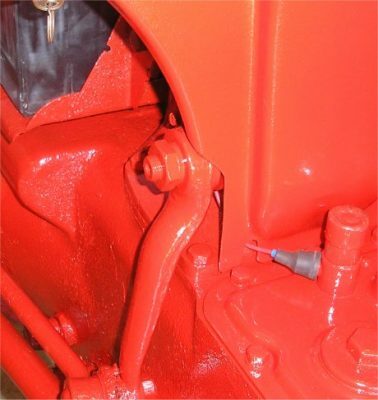 To upgrade to the later style box you will need a steering box and both pitman arms. The early pitman arms don’t fit the later box. You will also need to pick up a later model dash panel to match the steering box, or modify your old dash panel for the necessary clearance. Here’s how the early dash panel needs to be modified for use with the later steering box. Lastly, one of the drag links (tie rods) is an inch longer than the other. On the early models the longer tie rod was on the right. On the later models the longer tie rod goes on the left side. Just pop them off and switch sides. When you’re done you’ll have a much better steering tractor.